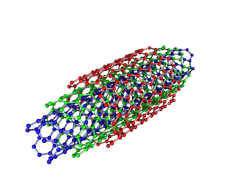 A new report highlights potentially important differences in the ways asbestos and asbestos-like carbon nanotubes affect the body. Scientists in Cincinnati have found that carbon nanotubes and asbestos may trigger malignant mesothelioma in different ways, suggesting that mesothelioma outcomes may be cause-dependent. Surviving Mesothelioma has just posted an article on the new research. Click here to read it now. Researchers with the University of Cincinnati and the National Institute for Occupational Safety and Health repeatedly exposed healthy mice to either asbestos or multi-walled carbon nanotubes and recorded the physiological effects. They found that, while both asbestos and carbon nanotubes can trigger the kind of inflammation that leads to malignant pleural mesothelioma, there are differences in the way they do this. “These results suggest related but distinct mechanisms of action by CNTs versus asbestos which may lead to different outcomes in the 2 exposure types,” writes pathologist Vinicius Carreira, PhD. “It is important for mesothelioma patients, families and caregivers to recognize that asbestos, while it is the most common cause, is not the only potential cause of mesothelioma. Understanding a patient’s mesothelioma trigger could impact the treatment plan,” says Surviving Mesothelioma’s Managing Editor, Alex Strauss. To read more about the asbestos/carbon nanotube study, see Pleural Mesothelioma: The Cause May Impact the Outcome, available now on the Surviving Mesothelioma website.